This is a project from one of our contributors. 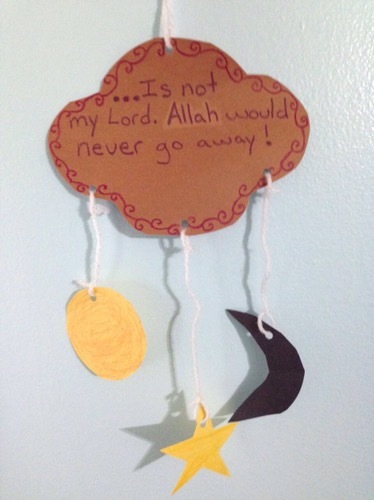 She made this mobile with her child to illustrate the evolution in Ibrahim’s (a) understanding of the divine. If you would like to read this story to your child there is a chapter concerning Ibrahim (a) in My Little Lore of Light by Hajjah Amina Adil. The mobile is made of construction paper and yarn. The holes for the yarn were made with a hole punch. Please share your ideas for teaching children about Allah (s) and his Prophets.